[prMac.com] Thousand Oaks, California - So you don't have enough timers for your various tasks? 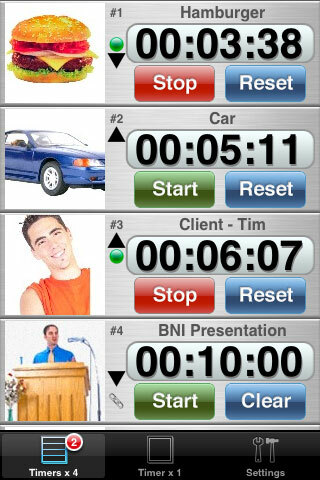 Geared for busy iPhone and iPod Touch users who need to keep track of time with various tasks - ranging from exercise routines to projects for clients - a just-released "Easy UP/down Timers w/Tilt and Shake Control" program provides 20 counters and timers with both a scrolling view of multiple timers and a single view of any one timer. Developed by Energize Software, it comes complete with unique tilt and shake control, timer linking, and provision for customized pictures and text for the iPhone and iPod Touch. Easy UP/down Timers w/Tilt and Shake Control for the iPhone / iPod Touch is only $1.99 (USD) and is available exclusively through Apple's iTunes App Store. Complete details and a video demo of Easy UP/down Timers w/Tilt and Shake Control in action can be viewed at the Energize Software site. Located in Thousand Oaks, California, Energize Software specializes in the development of iPhone and iPod Touch software. Its goal is to produce high quality and easy-to-use software that not only increases productivity but also entertains. Copyright 2009 Energize Software. All Rights Reserved. Apple, the Apple logo, iPhone and iPod are registered trademarks of Apple Computer in the U.S. and/or other countries.